Last in our Historic Ales Of Scotland collection from Williams Brothers. This review came later than the others since, considering how dark it is — Guinness black! — we tasted it later in the evening. As you ought to know now from what we’ve said about the Williams Brothers collection, it uses a specific historical ingredient — one which was used for centuries of beer fermentation before it inexplicably ceased. In this case, elderberries are used! The nose is quite inviting. As one would expect of a dark beer, it’s relatively malty, making it fairly sweet; however, complementing the sweet malt smell are notes of fruit — elderberries, blackberries, blackcurrants, etc.. Moreover, the beer must be using roasted malt, because there are notes of coffee and burnt chocolate. This is typical of stouts and porters, but a beer need not be a stout or porter to contain roasted malt. These flavours likewise fall on the palate, with notes of blackberries — probably elderberries too, but I don’t recognize them as well — and roasted malt being the clearest expression of the beer’s unique character. While I initially found the nose quite profound, the taste blew me away — this is a highly flavourful, well integrated beer. 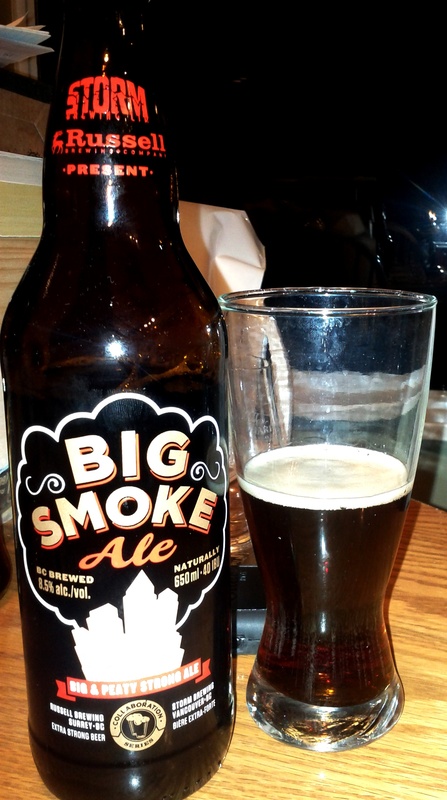 Although quite dark, even darker than the Big Smoke Ale we just reviewed, it is fairly easy drinking. This is likely why it’s not considered a stout/porter — the body just isn’t there. In other words, there are flavours typical of stouts/porters, but the texture just isn’t there. While I’d prefer a bit more body to it — the flavours deserve some extra substance — it’s refreshing to have such a dark beer that doesn’t weigh you down. The finish is quite long and pleasant; however, after just a few seconds the sweetness instilled by the elderberries — the fresh and fruity sweetness — dies off and leaves only the taste of the malt. 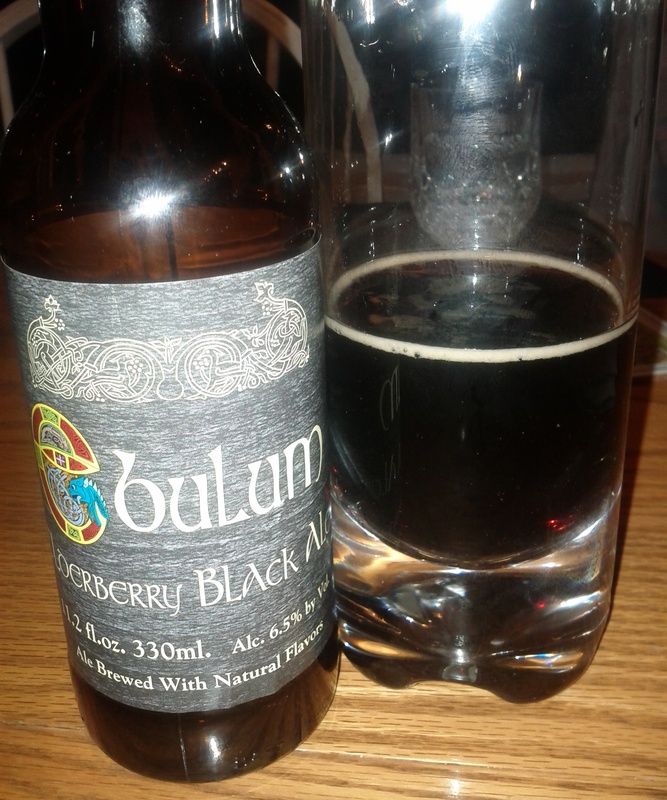 The Ebulum Elderberry Ale is quite delicious, and one of the best beers we have tasted thus far. Also, it’s the beer we have come closest to meeting each other’s scores, with the diversity of our scores being merely a few points apart; this certainly speaks to its approachability, since we clearly have different tastes. While I prefer the Fraoch Heather Ale, the Ebulum Elderberry Ale is a close second from the Williams Brothers. It’s too bad that they don’t release singles of this guy; I’d love to try it again, and I guess I’ll just have to wait until the collection comes back next Christmas. My favourite of the mixer pack, this beer was such a unique surprise that its originality won me over! While I have not had much exposure to elderberries outside of their incorporation into certain bake goods, this beer changed my opinion of them. And it’s not just elderberries, as mentioned by Kamran there are a variety of fruity/berry flavours contained in this dark beer. The fruity sweet nose is also herbal and malty and frankly the best part of this beer. Only a couple of beers have beat the score I gave for the scent of this beer which says a lot. The darkness of this beer makes it appear to be heavier then it actually is, but in reality it is a smoother less creamy texture than Guinness or other stouts or some porters. However, if asked what type this beer more closely resembled, either a stout or porter, I would have to say it is closer to the latter. The taste of the berries is unmistakable amongst the malty tones, allowing for a sweet refreshing ale. The finish is not prolonged. It is smooth and almost chocolaty from a roasted malt, yet simultaneously herbal. A unique and enjoyable combination. This beer is more than a one-off. It’s complex, smooth and it’s memorable! Good for a session ale with friends, it further proves that not all black coloured beers need be “liquid bread” and super filling. I look forward to its return in Canadian stores. 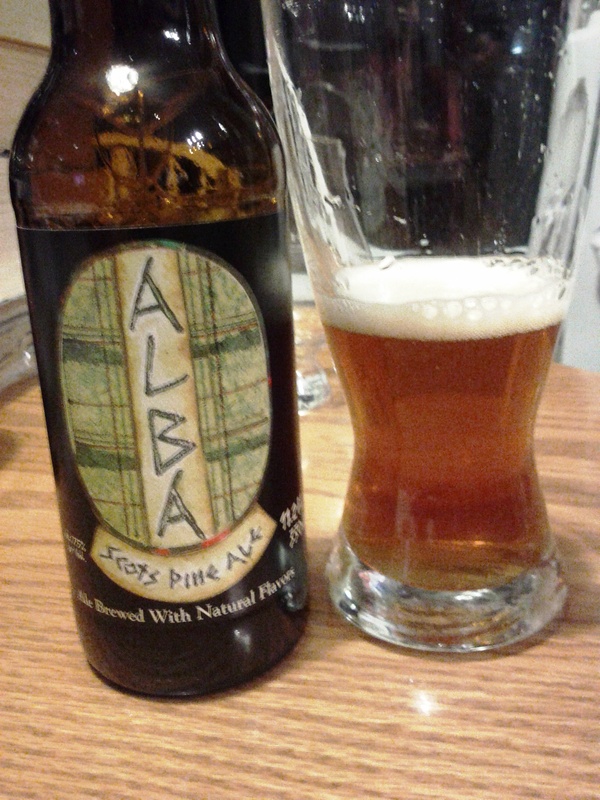 The Alba Scots Pine Ale is the third ‘historic ale’ from Williams Brothers that we tried. As the name suggests, it uses Scottish pine and spruce in its fermentation. This style was originally brought to Scotland by the vikings and was still popular until the late 1800’s. The pine was boiled down with the barley, and the spruce was added shortly before fermentation to infuse themselves into the brew. The most intriguing aspect of this ale, for me, is its aroma. Along with a subtle sweetness of vanilla and oak, there is the smell of skittles! Not any particular colour of skittles, but just skittles in general. This note of skittles isn’t overwhelming, but it’s certainly noticeable. This candylike flavour continues on the palate, while the malt gives it a similar kind of vanilla/wood sweetness typical of the Tullibardine beers we previously reviewed. While the body has a nice mouthfeel and texture, the ale is surprisingly heavy, in a sort of odd way. I wouldn’t want to drink too much of it — two or three tops. The finish leaves one wanting more, as the flavours dissipate rather quickly. Perhaps this is just because the initial taste is so much more intense. All in all, an enjoyable beer that I hope to get a hold of again. I found this particular historic ale to be a bit of a surprise. It’s aroma was sweet to the nose, as well as slightly malty and even fruity, though I believe that would be the influence of the spruce. As the picture shows, it is a beer with a rich colour. It is crisp, but somewhat heavier than typical ales – so perhaps not one to overdo. When we tasted the beer we felt it was sweet and almost had a taste like Skittles, which was covering a light maltiness to the beer. The short lived finish was what brought down the score on my review card, mainly because the aftertaste is rather brief for a beer with such strong flavors and aromas. Overall though I’d say it was a solid beer and a pleasant surprise to taste, and I look forward to having another in the future. I tell you, the Scots really know how to brew unique beers. Continuing the tradition of “Let’s brew a beer using random plants we find on the ground”, the Alba Scots Pine Ale is actually surprisingly good. I was really able to notice the pine in the light, fresh aroma that reminded me of a forest on a cool day. Although not terribly crisp and relatively heavy, this ale was still easy to drink due to its refreshing nature. I particularly enjoyed the flavour, which was heavily influenced by the pine, and created a sense of sweetness, reminding a lot of eating skittles. Contrary to my fellow reviewers, I found the sweetness in this particular beer lasted an appropriate amount of time, definitely encouraging you to take another sip. Second in our Historic Ales Of Scotland collection is the Williams Brothers most popular and well distributed ale: the Fraoch Heather Ale. The Fraoch is available in single 500ml bottles from the LDB, so select BC Liquor Stores and Private Liquor Shops carry it, unlike the other three ‘Historic Ales’ which are not available individually. Brewed since 2000 B.C., the Fraoch utilizes heather in lieu of hops. What makes this beer special is the unique flavour that the heather imparts. While it is floral and herbal, with a delicate touch of sweetness, there are also notes of peat and smoke, especially on the nose. For the whisky drinker, this peat flavour is highly appreciable, especially since it is so well integrated into the Fraoch. While it has a robust body, the Fraoch is rather easy-drinking, making it perfect as a session ale. I could easily put this up against some of my other favourite session ales, such as Phillips Blue Buck or Anchor Steam. I could drink many of these in a night, and not get tired of it. On the palate, the heather comes off with a pleasant sweetness, and just a touch of peat. It’s quite delicious, and the floral finish remains crisp and consistent. 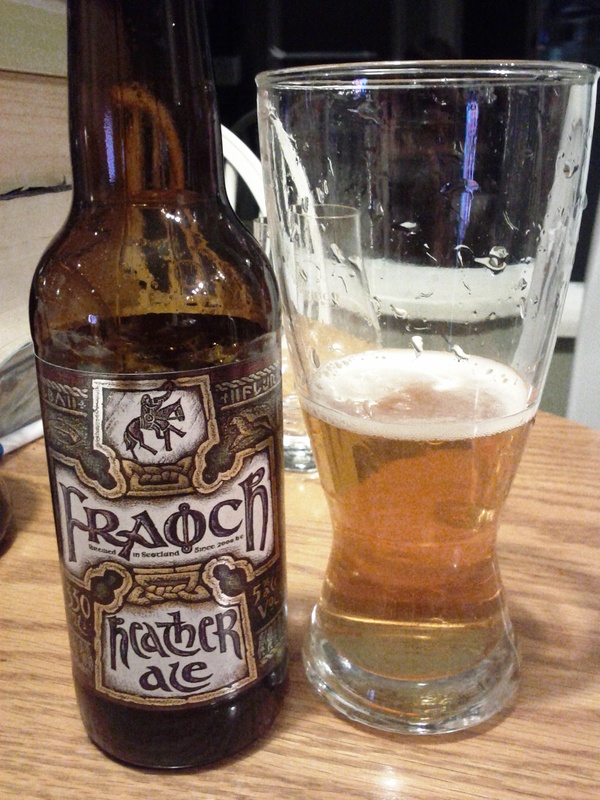 With an inviting floral/herbal nose, it is hard to pass up a Fraoch Heather Ale. I’ve had this beer on several occasions and have always enjoyed it and recommended it to friends. In the light golden appearence is a crisp, fresh beer with a smoothly balanced combination of malt, peat and the heather’s floral sweetness. While the aftertaste is slight, it has a flowery taste on the palate and is dry like a white wine. Really the best features of this beer are the flavour and finish. In British Columbia this beer is released seasonally, so if you see it at your local store in a 500ml bottle, grab yourself a couple for roughly $5 a piece; on a hot or busy day you wont regret cracking open this one. Another in the unique Scots brew collection, the Froach offers yet another unique drinking experience. From the outset, it is hard to know what to make of this beer, since the heather used in the brewing process does not create a very discernible scent, only leaving a slight hint of heather behind and nothing else. The main attraction, however, is the body and flavour, where the floral presence really comes out. With a smooth, light texture, this beer goes down very easily, giving it the refreshing properties more associated with a lager, without the carbonation. The taste add a light floral essence, which really lightens the impact of the hops and creates a distinctive and enjoyable experience. The heather remains on your palate throughout the finish, though this beer would benefit from the experience lasting a little longer. This is definitely a great beer to enjoy on a hot summer day, so, for those Coors Light fans out there who aren’t opposed to shelling out a few dollars for good beer, this is definitely for you. Grozet is the first of four Williams Brothers beers we tasted on this night. They came packaged together in a collection called The Historic Ales Of Scotland, a relatively expensive, but amazing collection that I would urge anyone to try — apart from the Fraoch, these unique beers are virtually impossible to find outside of this rare collection. Each beer utilizes a particular ingredient that was fundamental in historic Sottish beers — Goozeberry, Heather, Pine, and Elderberry. They are basically used in place of hops, to give the beers flavour, as well as balance the sweetness of the malt. 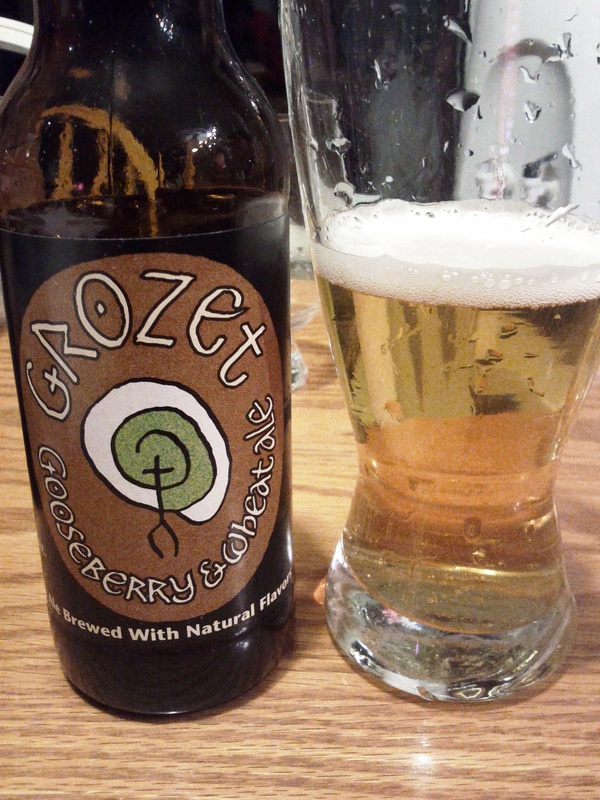 The Grozet, which we are reviewing here, is a wheat ale that uses goozeberry. The first thing one notices is the cloudiness, typical of a hefeweizen. Next, one realizes how pungent the wheat smell is. Though somewhat masked by the unique goozeberry sweetness and florality, the flavour of wheat is quite overpowering; this continues on the palate, and reaches lows during the finish, where the sweetness dies fairly quickly, while the wheat taste lingers. Though it is quite light, the beer is not highly refreshing; it’s not a beverage you want to drink quickly, nor one you want to drink heavily — one is enough! One would be better off to sip it and try to acquire a taste for the interesting flavours. While I was never quite able to do this, I’m able to recognize that it is not a ‘bad’ beer by any means, just one that fits certain palates better than others. Love it or hate it. This beer, as Kamran mentioned, is certainly one that you either enjoy or feel let down by. While I did not really find it that great a beer, I still would highly recommend people at least try it to decide for themselves. While I enjoyed the smell and even the body of the beer, the flavour and finish certainly left much to be desired in my opinion. Really not much I can say about this one… the other beers from the collection are much better all around. Here’s an interesting concoction, a wheat ale processed with goosberries. Not actually knowing what a gooseberry smells or tastes like made it difficult to pick out these essences in the beer, however it should have been easily distinguishable from the wheat. From an initial sniff, however, the wheat is by far the dominating scent, burying any other essences that may have been present. Upon tasting, you notice a slightly heavy beer which manages to go down quite smooth, yet has some tartness, possibly due to the presence of the gooseberries. This lead to an interesting flavour that seems dominated by wheat, which appears even stronger thanks to the goosberries, but once again, the berries are not directly detectable. If the berries were brought out more, they would act as a nice compliment to the wheat, but unfortunately this never happens. The finish is particularly disappointing, starting off far too sharp, quickly transitioning to a dull, lifeless taste that fades away very quickly. If the finish was able to keep the positive aspects of the base flavour, it would have scored higher. If you fancy trying a unique, hard-to-find, original Scottish brew, I would suggest trying the Grozet, but I doubt you will want more than one.